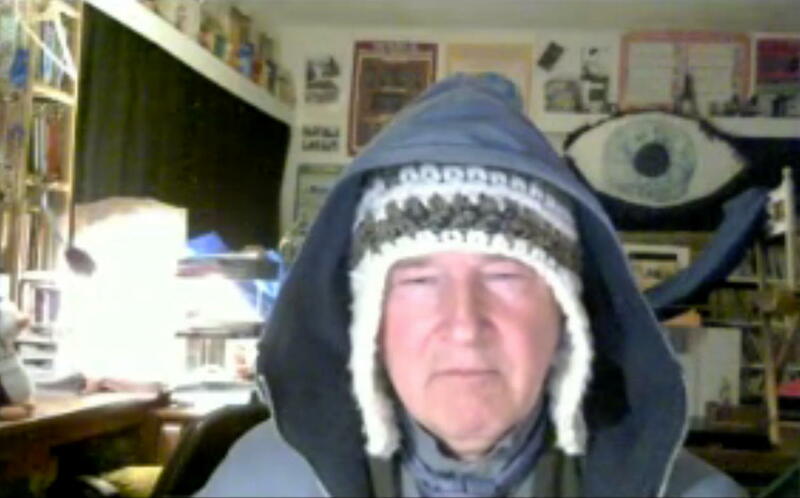 This morning I was having an e-mail conversation with superb performer John Williams. I missed his show My Son’s Not Rainman at the Edinburgh Fringe last year, but saw it recently at London’s Canal Cafe Theatre. It is about life with his autistic son. John did not put a creative step wrong in it anywhere. Writing, delivery, intonation, pacing, laughter, tears. All absolutely 100% spot-on for 100% of the time. 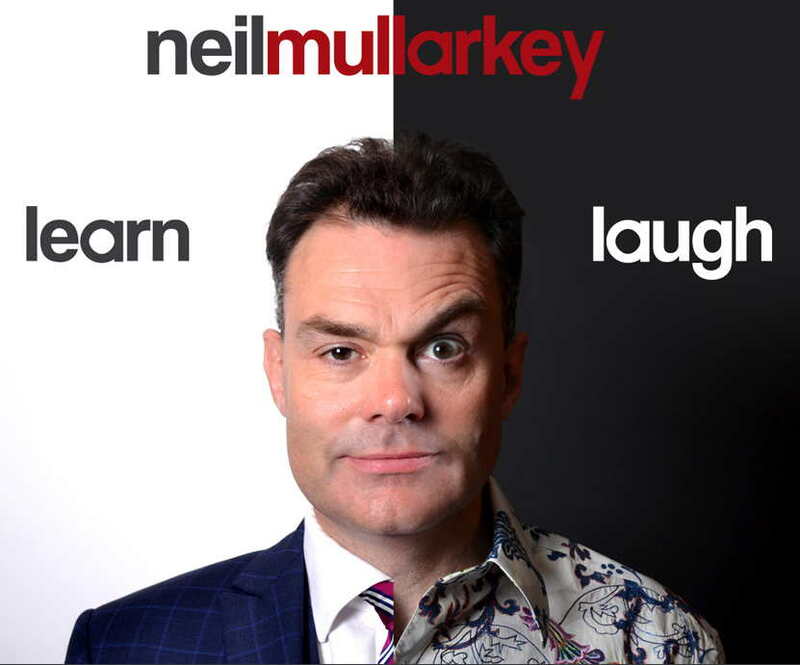 In this blog a couple of days ago, I posted two chats with comedian/executive business coach Neil Mullarkey. In the 1980s, he was in a double act with Mike Myers who went on, in 1997, to make the first of his three Austin Powers movies (in which Neil Mullarkey appeared). Back in 1985, Mullarkey & Myers were founder members of The Comedy Store Players and both were at the start of their careers. Neil Mullarkey was 24 and Mike Myers was 22. 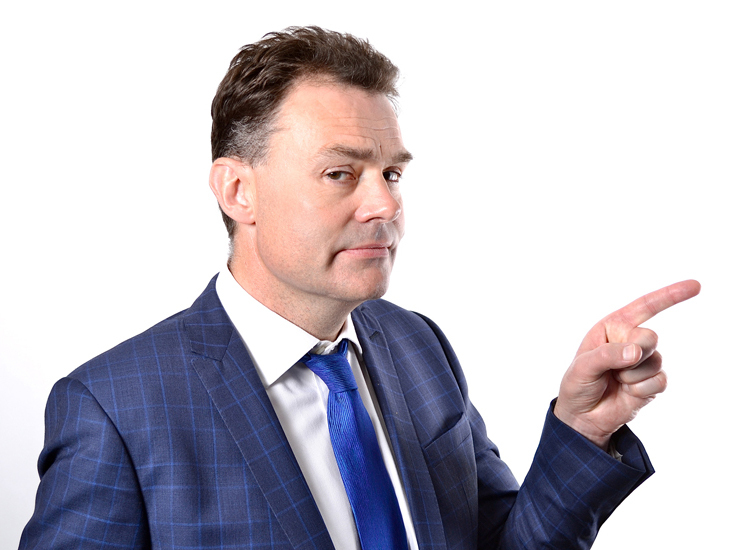 They wrote a list which I had been going to include in my Neil Mullarkey blogs this week, but which I regretfully cut for reasons of length. On second thoughts, though, it is maybe worth posting as a comment on the nature of time and fame and humility. Most people born after a certain date will not know who most of the people mentioned in this list are… or were. Fame is fleeting. Names and people and their lives are quickly forgotten. 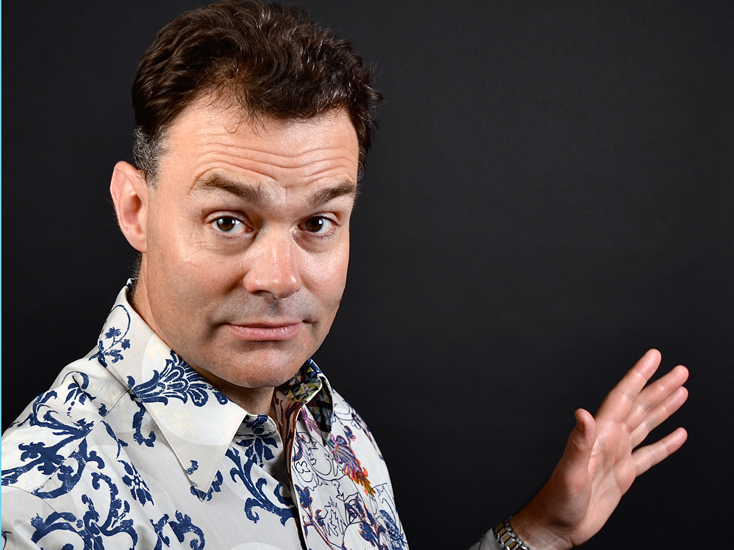 How did a stand-up comedian and improviser become a business guru? 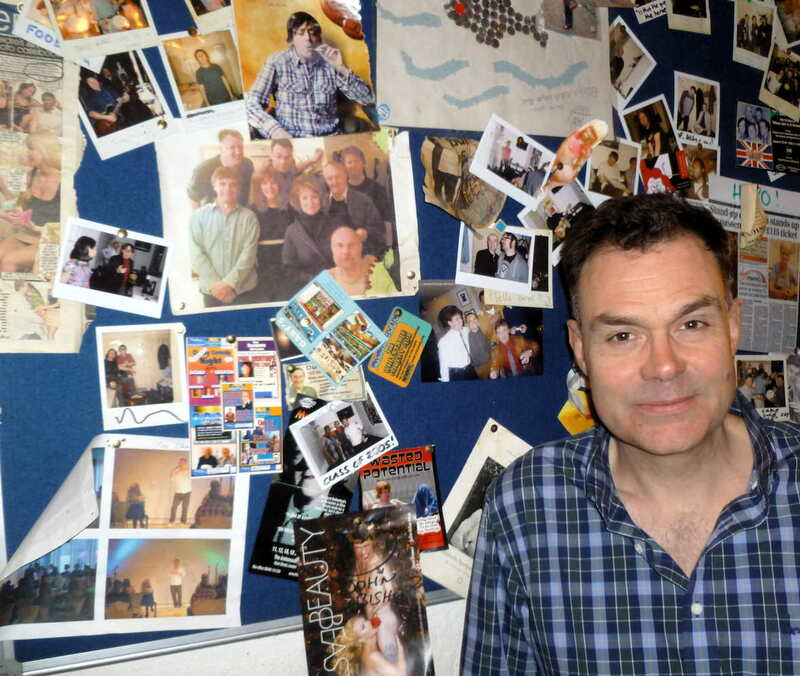 In yesterday’s blog, I talked to Neil Mullarkey about his memories of 1980s alternative comedy. I talked to him in the dressing room of London’s Comedy Store before he improvised two hours of comedy with The Comedy Store Players, the group of which he was a founding member in 1985. 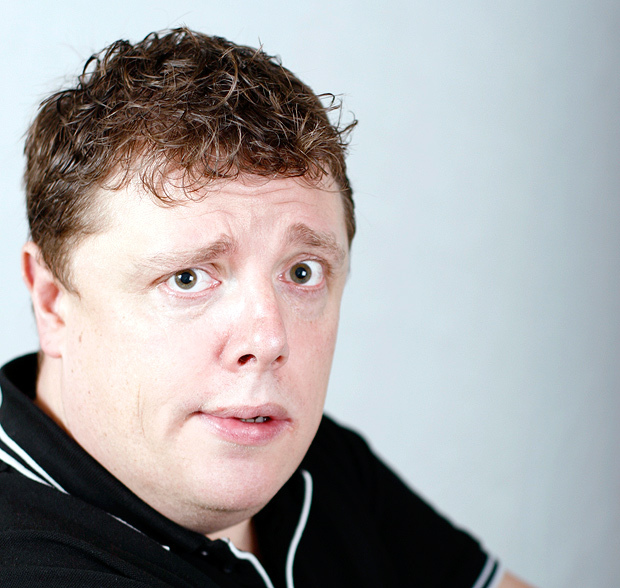 Now, he mostly makes his living from running improvisation workshops for businessman and organisations – Improv Your Biz. 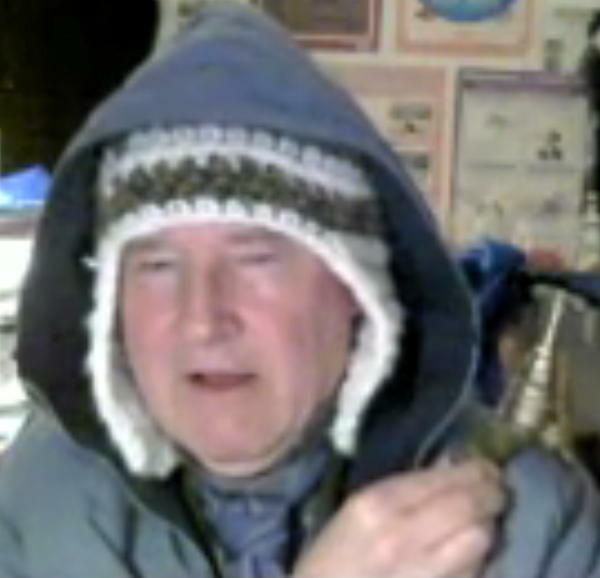 As well as this serious business guru career, Neil also occasionally pops up as spoof life coach guru L.Vaughan Spencer. Neil’s chum PR guru Mark Borkowski advised him to distinguish between the two. So, as L.Vaughan Spencer, Neil sports a small beard and ponytail. 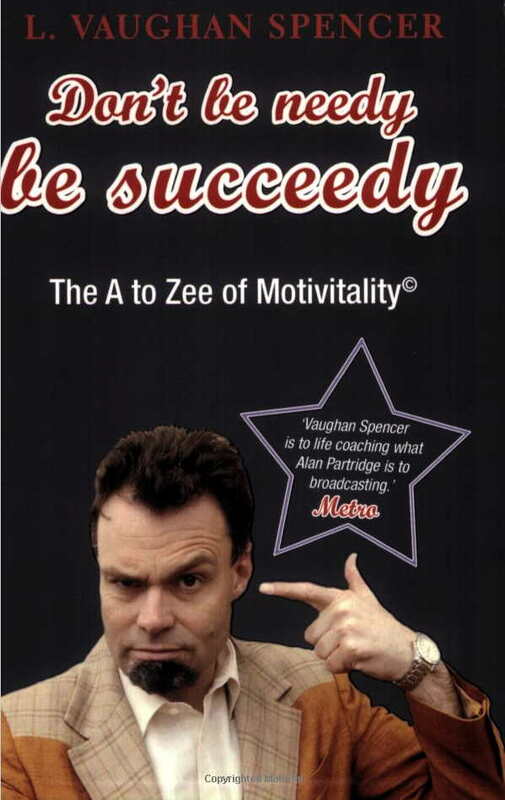 L.Vaughan Spencer staged a show Don’t Be Needy, Be Succeedy in 2002 and, in 2008, published a book: Don’t Be Needy, Be Succeedy – The A to Zee of Motivitality. “Yes,” said Neil. “I met him when he was selling tickets for the Cambridge Footlights show I was in at the Gate Theatre in Notting Hill, London, and he made me laugh. “He told me he had been at Second City in Canada and that was where my heroes were from. My heroes were John Belushi and Dan Ackroyd. The Blues Brothers was the thing I wanted to do. American comedy was what I loved. American sitcom. And Mike told me about improv where it’s about ‘accepting offers’. “I visited him a few times. We did our show in Toronto and the audiences got it. When I visited America, I did quite like being the foreigner. You become more English when you’re in America, because people say: Do that accent! I’m pretty English anyway, I suppose, even though I’ve got an Irish name and I was brought up in France for my early life. I went to LA a few times and thought This is great to visit, but I don’t want to live here. I like England and I like London. “Yes, a bit of that. But also, when you are an older comedian, you’re not as interesting to people in TV and radio. They want Who is the new person on the block? They want Who is the same age as me? – They don’t want to discover somebody that’s already been discovered. “I also found that the vehicle for most comedy on TV and radio was the panel show. It tends to be quite combative and un-collaborative and I’m not very good at that. But also, philosophically and psychologically, I was looking at other things. I was interested in how organisations and businesses function. My degree is in psychology, sociology and economics, so I was always interested in that. “What does Provocative Therapy provoke?” I asked. “It sounds confrontational,” said Neil, “but what you do is satirize people’s self-limiting beliefs in order to help them achieve mental health. You assume the answer – the solution – is within themselves. “If you say I want to give up smoking, I’ll say Why? Smoking is fantastic! It’s really cool – You should be smoking more! And then they go: Wait a minute. This isn’t what I expected and they begin to think Why DO I want to give up smoking? “Frank Farrelly’s idea is that you hold up a weird hall of mirrors to people to make them look at themselves and think Hang on! What IS it I want? “It’s a word I made up,” said Neil. “It means you are listening with intent. You are so focussed on the other person that you pick up their threads. “Provocative therapy is about accepting ‘the offer’ – like in improv – and almost taking it to absurd heights… How many cigarettes do you smoke in a day? 20 a day? No. You should be smoking 200. Can you make that a promise? 200? “Well I do it. I am just teasing them. Frank Farrelly said you’re just teasing people back to mental health. “That’s what it is,” said Neil. “But my contention is Why go build a raft and do paintballing? – That has nothing to do with your job. Do something that is relevant to your job – and what is the thing you most do in a job? You talk to other people. So here is a ready-made philosophy – improvisation – which actually started in the 1920s in Chicago as part of the New Deal. Social workers helping children who were diffident in class, didn’t speak English as their first language… Exercises to enhance their confidence.. 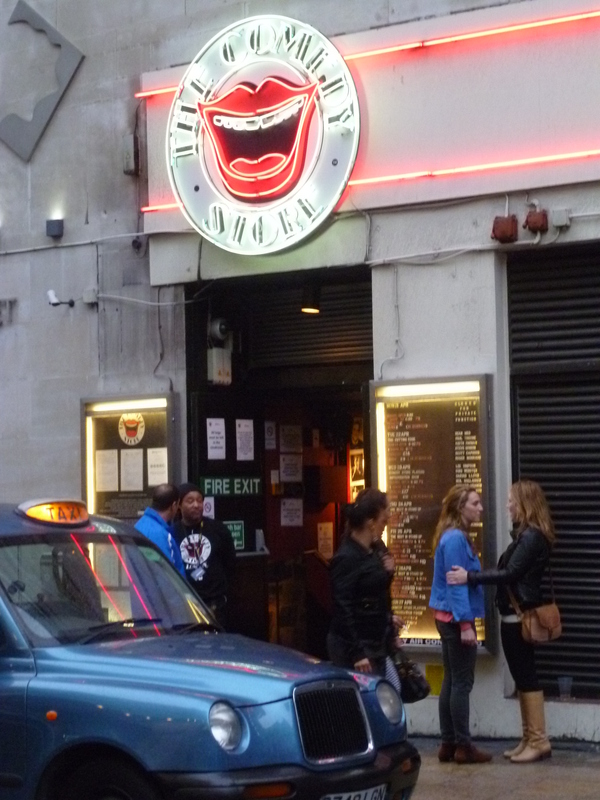 I went to see The Comedy Store Players’ improvisation show last night. They perform twice weekly at The Comedy Store in London. 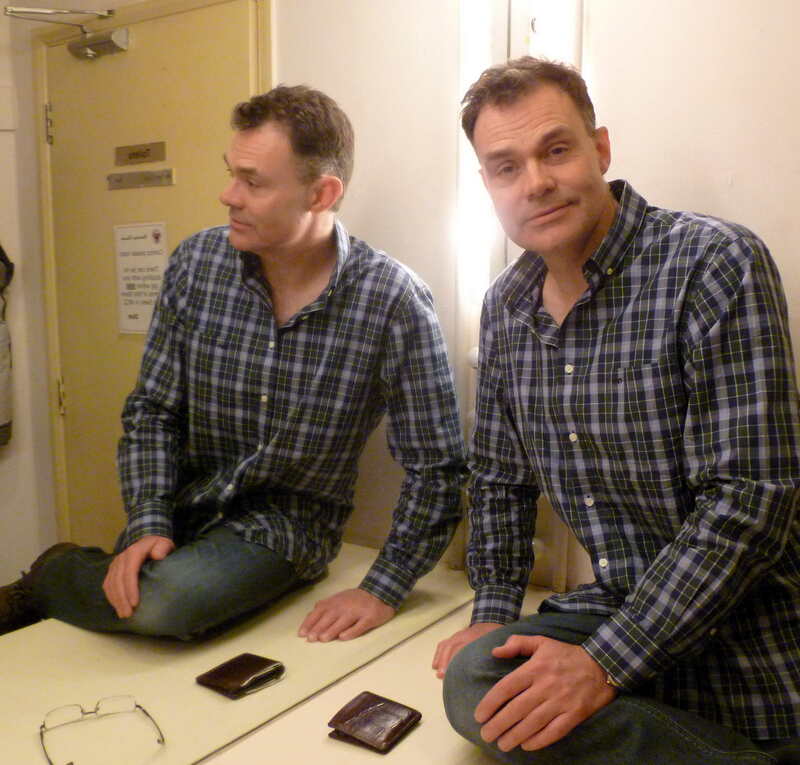 Before the show, I chatted to Neil Mullarkey, one of the founding members, in the dressing room. He told me last night: “I apply the skills and ethos of improv to business people, but I don’t consider myself a business person. I still do the Comedy Store Players, but that’s about the only showbiz I do these days. I really enjoy teaching people and looking at how organisations run. I have made my choices and I feel very pleased by them. “The idea of getting in a car or a train and going to some distant place and doing a gig to some people who are drunk and not that interested and then coming home again does not appeal to me greatly. In how many professions do you want the customer to be inebriated? I can only think of two – gambling and prostitution. “Which audience is more drunk, though?” I asked. Neil used to be in a double act – Mullarkey & Myers – with Mike Myers, who went on to appear in Saturday Night Live on US TV and to write and star in the Austin Powers movies. 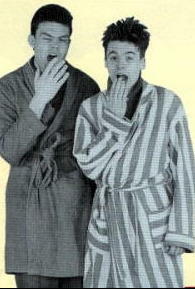 There is a YouTube video of Mullarkey & Myers in their 1985 Edinburgh Fringe show. “The Comedy Store Players started in 1985,” Neil told me, “and around that time I used to host the Tuesday night and Mike and I did a longer 40-minute version of our show. We were on the bill with people like The Brown Paper Bag Brothers (Otis Cannelloni and John Hegley) and then, starting at 10.00pm or 10.30pm was the Open Mike Night and, by 2.00am, it was very odd. You had people with musical instruments talking about their time in mental health institutions. “There was The Iceman,” said Neil. The Iceman’s act – as previously blogged about – was simply to melt a block of ice. But he usually failed. “Did he have the repetitious music?” I asked. “I can’t realise you love me,” sang Neil enthusiastically. “And the sounds. Shhh-wssshhhhh. With the thunder and the rain. And then, after about 15 or 18 minutes it was I can’t realise you love me – But I don’t love you! – What? “When I started in the 1980s with Mike Myers and Nick Hancock and occasionally on my own,” said Neil, “there would be a room above a pub and the other acts were weird non-professional stand-ups in their work clothes. Mike and I had rehearsed and put on different clothes to do the show. We did theatrical sketches that asked you to create the fourth wall. “I remember one time in the mid-to-late 1980s seeing this very talented young guy – an open spot – who had incredible stage presence doing characters. He ran offstage between characters to change his costume and he had his manager with him. A manager! I had not heard this idea of having a manager. Surely you just turned up and took the cash? The act was a man called Steve Coogan. “Now there are people who were born after I started who leave university or college and say I want to be a comedian and they have a manager who will give them £50 a week and get them on the road and they can get better at their job and make a career. That was unheard-of in my day. The Earth Exchange in Archway Road served only vegetarian food and the room was so tiny it felt as if the performers were almost sitting on your table. “Presumably a stuffed rabbit?” I asked. I think both of us hoped it was a real rabbit. I asked Steve Bowditch about it this morning. “Did you really pull a top hat out of a rabbit?” I asked him. Memory fades after a career in surrealism. “Who knows?” said Neil. “Something like that. I haven’t read it myself, but I’m prepared to quote it. Why do we want laughter?… Is it to purge ourselves of the dark thoughts we have – and so the clown, the jester, the comedian brings out the darkness and makes it somehow acceptable? 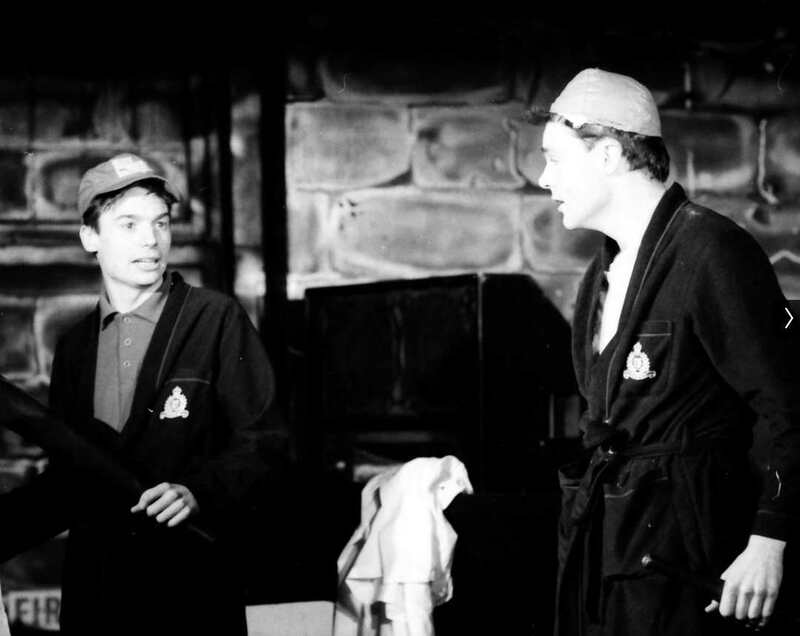 Comedian Nick Revell tells me that the ‘Top Hat Out Of The Rabbit’ routine was done by Lumiere and Son in their 1980 show Circus Lumiere… and the act banned from the Earth Exchange for throwing meat was The Port Stanley Amateur Dramatic Society (Andy Linden and Cliff Parisi). There was a man called Anthony Irvine, who did an act where he just crawled across the stage wearing a yellow souwester cape and Wellington boots, got up a ladder, then put a chain with a hook on it between the two parts of the stepladder and picked up a bag. He took a toothbrush out of the bag, cleaned his teeth, got down the steps and crawled off stage again. This took between ten and twenty minutes depending on audience response. Today he calls himself The Iceman and melts a block of ice on stage – that’s his act. It is, indeed, an act in which he tries to melt blocks of ice in various increasingly desperate ways. You have to see it to believe, if not understand, it. I first saw The Iceman when I auditioned him in 1987 for TV show The Last Resort With Jonathan Ross. The audition is on YouTube. 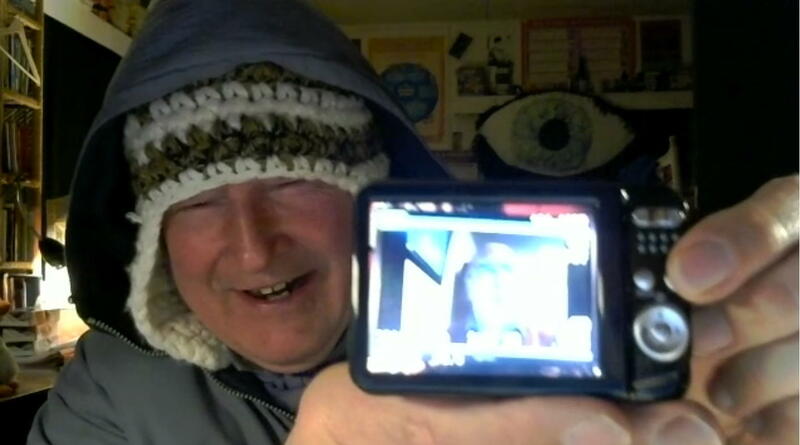 A couple of days ago, I talked to The Iceman via Skype. “You can facilitate my comeback,” he told me. “You’ve never been away,” I replied. “Did you get a good audience in the foyer?” I asked. “So why am I talking to you for my increasingly prestigious blog?” I asked. “There are pictures of ice blocks for sale on the website,” said The Iceman. Then he put a tap on his shoulder. “Ah! The Tap Water Award!” I said. 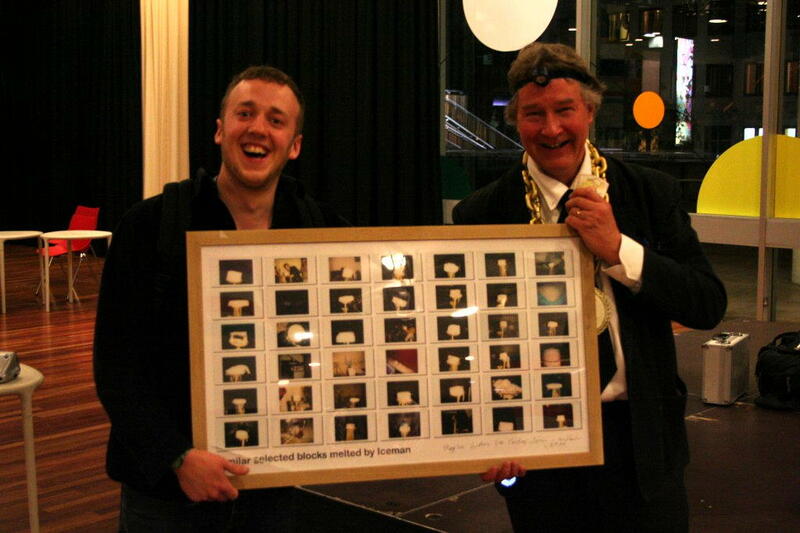 For several years, it was given at the Edinburgh Fringe as an alternative to the Perrier Award. “Did you win it?” I asked. The Iceman waited for me to react. “Should I gasp?” I asked eventually. “Why did you drop the block into the Thames?” I asked. He held up a camera and started taking pictures of the Skyped image on his computer screen of me looking at him looking at me on my computer screen. “What do you see your role as?” he asked me. “A sadly free publicist to interesting people,” I replied. “Every comedy person and bizarre person seems to have a link with you,” he said. “You’re a conduit,” he said. “What do you really think of the Iceman?” he asked. “He could have me in the foyer,” mused The Iceman.